Why do we need to work with the body? "Most of us consist of two separated parts, trying desperately to bring themselves together into an integrated soma, where the distinctions between mind and the body, feelings and intellect, would be obliterated” (Kirschenbaum and Henderson 1990, p. 370). We are coming to a time in the world when the body is more recognisable as an important part of the therapy. More frequently now we reach for alternative therapies, holistically looking at the condition we are in. We go to massages or take yoga classes, where we learn to gently release tension build-ups caused by everyday rush and stresses. But it is only a drop in the ocean. The little awareness we have of our body and the fixed thoughts about the way we need to look, move, feel and experience is prominent. We have been taught, and socially constructed, to be a part of this existing, collective reality. We gradually disassociate from the authentic being. Social oppression, body shame and trauma form our protective armour which takes us increasingly further away from what we really strive to be and what is our nature. As Carl Rogers mentioned, we are desperately trying to become complete. A complete soma. How can we do that when we only work with the mind? What is in mind? We carry in our minds what we have learnt through our lives, the system we have lived in and the system that programmed us in order to be able to exist in collective reality: society, community rules, obeying common laws, parental orders. The mind is a calculator, it analyses, counts and processes information. It’s like a computer. Jung once said, “What you resist persists and grow in size”. The mind will resist but the body will persist. If we cannot connect with both we then will create a block of energies that are trapped in our body. This energy will gradually destroy us. It will affect our organic systems and then eventually get to our brain causing brain dysfunction. The body is the container of everything that we experience, and the body is the shape of these experiences. It is an embodiment of our internal and external being. Through working with the body, by use of breathing and grounding exercises, we begin to listen to our internal self. The simple process of listening to one’s own breath can be the beginning of a significant change in self-understanding. Through listening we learn and only then can we make a difference. 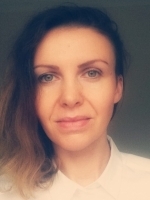 Justyna Isobel Matejek BA(Hons) MBACP, Counsellor and Body-Mind Therapist. Working with mind and body for over 10 years. Specialised in depression and anxiety, psychosomatic conditions and trauma.